I started the day in a very comfortable bed at the Iraklio Hotel. After a proper shower and delicious breakfast (they even had gluten-free bread! ), I moved towards the bus station (on the other side of the town) to catch a bus to Ano Asites. When I got there, I was told I was on the wrong bus station. See, there are two of them in Iraklio – the “A” for long-distance buses and the “B” for local ones. I had to get a city bus to reach the other bus station… which was just steps from my hotel. Oh, well. I was glad I made it to the bus – at the last minute! After I had to quit walking along the E4 around Rodakino (already in Rethimno district), walked to Plakias from where I took a bus to Rethimno and then Iraklio. After reading a lot of trail descriptions, I decided to start again in Ano Asites. It had a good bus connection from Iraklio and it was realistic to walk for four days (that's what I had left) and make it to a town with bus connection back to Iraklio. It proved a very good decision - I loved the change of scenery and it was lovely to experience a different side to Crete - much greener and pastoral than the rough and wild western side. Ano Asites - the perfect destination for photographers! I was left in Ano Asites – right in the middle of a charming old village. The day was beautiful, sunny and warm. With every turn of the street, I could find just the perfect little scenes for taking a photo. I was lucky the sun was shining, it was magical. I soon found the E4 trail and could continue my trek. Before I decided on continuing my trek from this village, I’ve read multiple descriptions of the trail. For a while, all was good till I reached a lovely chapel with a resting place and a spring. About this spot, it said that the trail continues on a “path that is difficult to discern”. That was an understatement of the year! The chapel sits on a steep slope of a gorge, hugging a big rock. The path is supposed to go along the slope for a while, then reach the bottom and continue. Easier said than done. It is possible that there was a path one day, but it almost completely disappeared. Once in a while, there is something of a path which then stops and you are on your own to navigate your way on a very steep slope, among thorny bushes, rocks, boulders and loose soil. The rocks were often moist and/or covered with moss. My walking was slow and tiring. I was glad I had my hiking poles to stabilize my walking but even that wasn't enough. Even when I finally saw the dirt road I was supposed to reach, it was not easy to cut through to it – there were goat fences and huge boulders to find my path through. There was a guy standing by the road (a worker) watching me moving in his direction with a surprise. I know tourists, and hikers in particulars, are not a daily occurrence! He asked where I was going showing me a sun-burnt map on a board right next to the road. I guess that was an official entrance to the gorge. I was happy to say that I knew I was to move up the dirt road. The path was steep for a while but lead through beautiful pastoral landscapes. It was pretty obvious that spring comes early in those lands! I also noticed it was much greener here than in the western areas of Chania. Green pastures, olive groves, and vineyards were all around me. I walked through the village of Kerasia and Venerato, both lovely settlements. After a while, I reached the Palianis Nunnery. There weren’t many people around but it was obvious this was a popular place with pilgrims – there was a big parking spot (now empty). For my personal needs (the heathen that I am) I was happy there were toilets open. I moved up the wide rock stairs right next to the nunnery and walked around it. The views from the top of the hill were just stunning. With every passing minute, I started to worry about a spot for the night. This area pretty rural and there weren’t any wild forests or such. I really didn’t want to be found wild camping on someone’s property as I had no idea what would the reaction be. In the end, I crossed a small spring and moved up toward an olive grove. I hoped no one could see me there and that the owner was back home from work. I was on the very edge of it, close to wild bushes and unused road. I'm not scared of the solo camping itself - but as a severely anxious person, I just didn't want to meet any people. The moment the sun set, the temperatures dropped like crazy. The humidity was very high and I felt cold. I was inside my summer sleeping bag which wasn’t enough. I finally put a second pair of pants on and a second pair of socks – only then I started to feel better. I could see my breath and I tried to cover up every inch of my skin. Ano Asites – wild camping near Sinapi. 10, 7 km; 305 m of total height gain, 617 m of total height loss. The next day, with no surprise, I had a big problem with condensation. I tried not to move much so I didn’t get “rained” on. I was happy that the sun was shining right from the beginning but I knew it would be not enough to dry the tent by itself. I packed and moved everything outside and then cleared the tent of most moisture with a foam-like rag. I can highly recommend them – much better than fast drying towels. Those are the kind that is hard and stiff when dry but get soft when wet. They soak up all the moisture really well. After that the sun was doing the rest – pretty soon the tent was completely dry and I could move on. That path again took me through picturesque villages, olive groves, and vineyards. As much as it caused me anxiety, it was nice to see people waving to me or striking a conversation. The language barrier was a bit much but nevertheless, it was nice. At one moment, when I was passing through a village’s main square, from its tavern an elderly gentleman run out and shouted, “Fraulein! Fraulein!” when I turned around, he started to ask me if I was from "Deutschland" and could speak German. He was visibly sad when I said I was only speaking English. I am guessing it would make his day if he could speak German with someone! When I reached Profiti Ilias I could finally stop for a coffee. I didn’t make any at the camp because I was anxious to move on. I got to a nice café only to be disappointed that, as usual, the patrons were smoking. But at least I got a good double cappuccino and could update my FB so friends and family knew I was OK.
Profiti Ilias seemed more of a town than a village, with the main square and many streets leaving various directions. I'm pretty sure people who live here must have strong legs - there was hardly any flat road here, all going up or down! 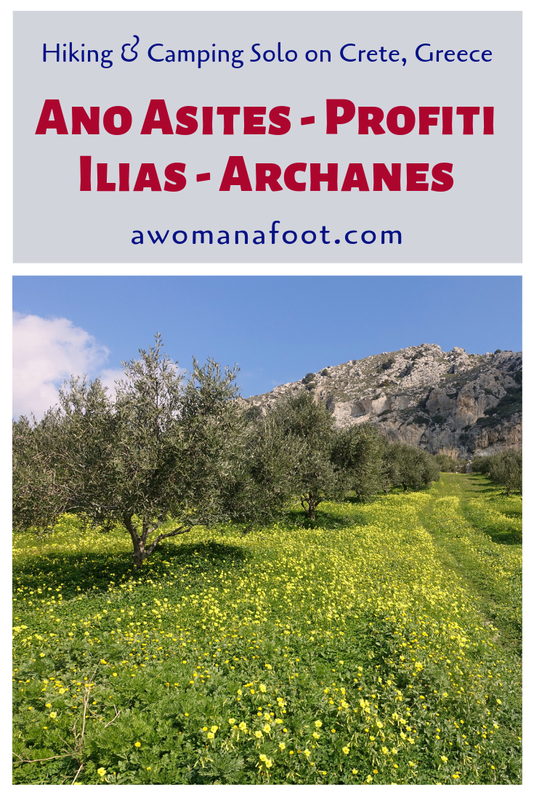 After Profiti Ilias, the walking was back to the regular style: dirt and paved roads with stunning views toward green fields, vineyards or olive groves. At many of them, I could see or hear people working - cutting branches, fixing whatever needed to be fixed and getting ready for a new season. The biggest problem of that day hiking was finding the correct spot to cross a very narrow stream. The descriptions on the internet were not clear, a map even worse and the terrain really confusing. There were trail signs (red spots) but the way they lead just didn’t make any sense. I saw on the View Ranger where was a path I was supposed to reach on the other side of the stream but there seemed to be no way to reach it. Obviously, the stream itself was not the issue – but there were huge bushes of reeds growing on the banks that were blocking the way completely. I was going back and forth, trying to find my way and finally relied on View Ranger to simply try and find a crossing to the path on the other side. When I finally found it I felt like Moses crossing the sea. Except that the stream was maybe half a meter wide and had hardly any water in it. Seriously. The path on the other side is wide and well-marked with E4 trail blazes. It leads steeply up toward majestic rock formations. By then the sun hid behind clouds and it got much colder. I reached a paved road and moved on with my eyes open for a spot to camp – it was getting pretty close to sunset. I didn’t have much water and there was nothing around. I decided not to push any farther but to move on into an olive grove. This time I had a spot over tall grass and weeds. This was nice for being softer but also completely wet when the dew fell. As I didn’t have a proper access to water there was no sense to cook any dinner. I had pre-cooked Mexican rice and warmed it up in my Jetboil. I don’t think it was the preferred way of preparation but it was edible, although a bit dry. Right away I put extra layers of clothes as I knew this night would be as cold as the previous one. Wild camp near Sinapi till wild camp near Archanes 17,1 km; 804 m of ascent, 549 m of descent. Have you ever hiked on Crete? How was it?